The icon of Japan, Mount Fuji (Japanese: Fujisan), is the highest mountain in Japan at 3,776 meters. It is a perfectly symmetrical volcanic cone, and it is well known for its beauty. Added to the World Heritage List in 2013, Mount Fuji has attracted more and more attention from people all over the world. It is interesting that UNESCO selected Mount Fuji not as a “natural” but as a “cultural” heritage site. It is sure that Mount Fuji has inspired many artists and poets, as well as it has been the sacred place of pilgrimage. It shows that Mount Fuji has been loved by people for a long time. 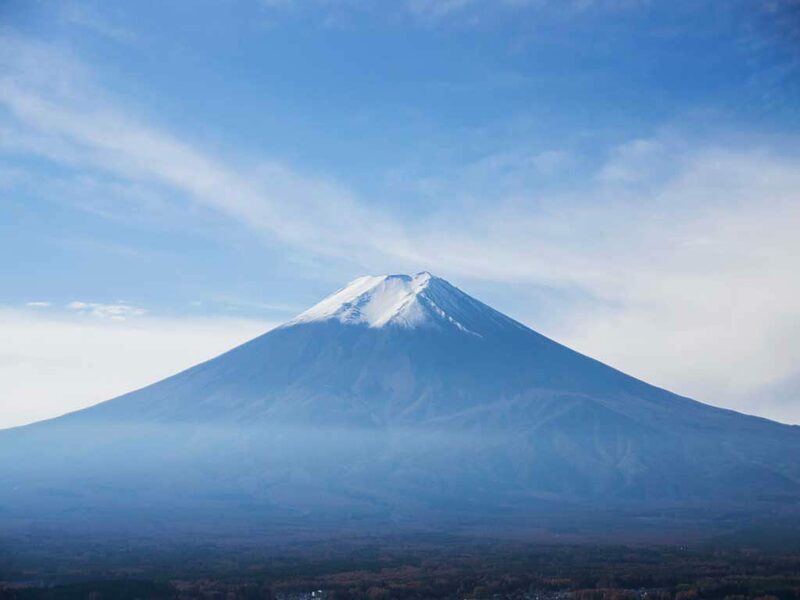 Mount Fuji straddles the border between Shizuoka Prefecture and Yamanashi Prefecture, and people in each prefecture always say ‘Mount Fuji belongs to OUR prefecture’ though it doesn’t matter to most Japanese. These days more and more people from overseas are climbing Mount Fuji. However, the climbing season is very short. Usually it is from early July to early September (It depends on the year). You are only allowed to climb the mountain during this season, and when there is a risk of a landslide, you can’t climb even in this season. If you want to climb Mount Fuji, you need to check the information beforehand. It is important to know what kind of equipment you need. You have to wear quick drying underwear, warm clothes, trekking shoes, waterproof jacket and trousers. Be sure to bring your rainwear, other warm clothing, head lamp, snacks and bags to bring trash back. Credit cards are not accepted at most mountain huts, so you have to bring cash. When you use a restroom, coins are useful to make a contribution. It is better to bring your hat, sunglasses, sunscreen, map and walking poles. Mount Fuji is an active volcano, so you are advised to bring your helmet, dust mask and dust goggles just in case. Climbing Mount Fuji would be a wonderful memory. You might feel like a pilgrim and know Japan better than Japanese people who have never climbed it. I have climbed when I was young, and I can’t forget about it. Why not give it a try?